So great to get home from work yesterday and have college football on the telly. Happy Football season to all. I'm off to the airport in a while, first to ATL for about and hour and then a red eye to Buenos Aires, but not before offering a few terribly under-researched and chalky picks. It's pretty simple, Cal is just better. Loss. Tennessee 35-18 Cal. Uggh, nevermind. I'm expecting really big things from the cats this year and think they will start off with a bang at home. I think TxT, and their Cobra Kai attitude towards scoring against lesser opponents, might get the cover all by themselves, but any help from SMU would be appreciated. Loss. Texas Tech 35-3 SMU. I think FSU is pretty overrated as Solon astutely points out. Miami might be underrated, but I think they have enough to get it done here. Loss. Miami 10-13 FSU. D'oh. OK, I'm off. 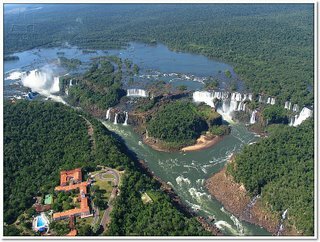 I just booked a 2 day excursion up to Iguazu Falls on the Brazilian border; looks unbelieveable. These waterfalls look totally average. Y'all enjoy the first weekend of CFB, and a Happy Labor Day weekend to all.